I had the good fortune of receiving this wonderful little car as a rental on my recent trip to Switzerland with my girlfriend. We had originally booked a manual Golf, only to find they had no cars of that class with a manual when we arrived. The rental agent offered to give us a free "upgrade" to the automatic version, but I asked if we could receive a manual car since that was what we reserved. Fortunately, she agreed and gave me the keys to the car we came to affectionately refer to as "Clyde". We found Clyde to be extremely well–suited to our needs traveling around Switzerland. I got the chance to drive in the city, on clear highways, and on twisty mountain roads in various state of water/slush/snow coverage. Due to the fact that it was a rental in a foreign country with my girlfriend as a passenger and insurance through a parent's credit card, I didn't get a chance to push the car to its limits, however, I do feel qualified to speak about its attributes in a range of common driving situations. By and large, the details of the Octavia's exterior worked well. The surprisingly attractive dark blue–gray paint was a tiny bit different, without calling any attention to itself—a good compliment to the Octavia's character. There were no ugly black plastic trim pieces or fake vents/scoops to detract from the design, and the lights matched the overall design language of the car and fit with the body lines. Roof rails give the car a more active appearance, but the nondescript alloys didn't do much besides exist. I found the corporate grill to be rather unattractive, but it does let you know it's a Skoda and makes its appearance a bit more distinct. Where this car really loses points is in the proportions. The stubby front end that houses the transversely mounted engine does not pair well with the long roof. A wagon should have a nice long hood, à la the classic Volvo bricks. For this reason I found the car a bit awkward looking taken as a whole, despite the successful execution of most of the individual elements. These days, Volkswagen cars are often lauded for their quality interiors. In this respect, the Octavia did not disappoint. Our car had a little over 3,000 miles on it—basically brand new—so there were no blemishes or damage whatsoever. The height, rake, and distance adjustable seat (although manually operated) with a tilting and telescoping steering wheel allowed a comfortable position to be found pretty easily. Visibility was good all around, and although the stubby hood looks a bit awkward, it increases visibility when parking. I found all of the hand controls to be excellent, with great ergonomic design. They had a solid, responsive feel, and almost everything besides the climate control could be comfortably operated from the steering wheel with minimal hand movement. Even the touch screen infotainment system was fairly smooth and intuitive, although the radio was so easy to control from the wheel I hardly used it. The materials were excellent considering Skoda's position in Volkswagen's brand hierarchy. Although everything besides the seats was plastic, all the critical touch surfaces (steering wheel, shifter) had a nice synthetic material that was soft to the touch, and never got sticky or made my hands sweaty. The rest was at least decent soft touch plastic, with the exception of the hard decorative trim pieces. Nothing to write home about aesthetically, but the interior really punched above its weight given the price of the car. The Octavia isn't fast, but it's not supposed to be. On–ramps were still fun to someone who mostly drives a 10 year old Civic, especially with the stick, but nothing special for a modern car. The best thing in this department though was the torquey motor that was surprisingly eager to rev. Drop down a couple gears, mash the pedal, and the car will give you an extra 10-20 mph in short order. This made overtaking and maneuvering on the highway a blast, and even on the steep mountain roads it would give you a good boost if you were in a low gear. The little diesel instantly made this car at least twice as fun. I guess that's why us jalops like them so much. Completely average. The brakes felt totally up to the task, but I never really got the opportunity to push them. Pedal feel was decent, although I couldn't get much through the large insulated boots I was wearing most of the time. The handful of panic stops I tried assured me there was no need to worry about being able to stop in time, and it was easy enough to avoid braking too hard in the low–traction winter conditions. I experienced absolutely no fade coming down the mountain roads, although I suspect this isn't unusual for a modern car with disks all around, and as I mentioned before I was driving fairly conservatively. My only complaint would be that the throw of the handbrake felt a tad short to me, but the car does its best to ensure you'll only need it when parking (more on that later). No complaints here. My first time driving a modern VW product without a sporty suspension setup, it felt comfortable and quiet. There was a fair amount of tire noise on the dry pavement, but I'll chalk that up to the snow tires. Bumps were felt, but never in a spine–shaking way, although the general quality of the Swiss roads didn't give me many opportunities to evaluate this. Even on the switchbacks there wasn't much body roll, so no motion sickness here. Overall, nothing special, but competent. The Octavia never inspired anything but confidence in normal driving. Although I didn't get to push it to its limits—not something you want to try for the first time on narrow snowy roads perched above a cliff—I would guess that it would understeer if gently pushed, given what I know about modern suspension design for cars like this. The handling was excellent in one area though, which made this the perfect car for our trip. The snow tires and AWD made for an unbeatable combination in all of the wintery conditions we encountered. Being from Michigan, I have a decent amount of experience pushing cars in the snow. With the amount of grip this thing had, I got the feeling that when it finally did break loose, it would be at an entirely unsafe speed. I retained excellent control under a full ABS stop on snow, and never felt a wheel slip in normal driving. I was continually surprised with how quickly I could safely drive the snowy roads, with my girlfriend's will to go faster giving out well before the tires did. 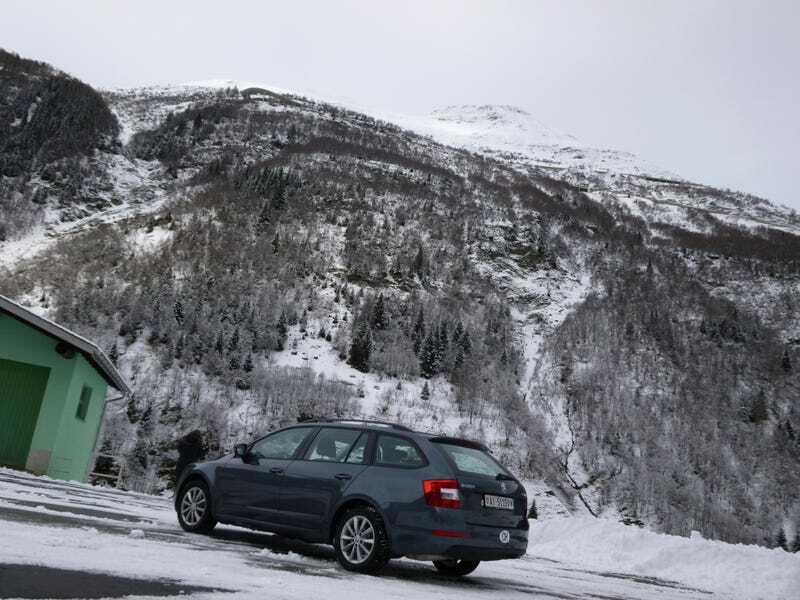 We rented snow chains with the car, but even in the worst conditions I never felt they were necessary. I'm conflicted about this one. The length of the throw was comfortable, because it knew exactly what it needed to be: unpretentiously long. The Octavia wasn't trying to make you feel like you were driving a Porsche, so shifts were fairly direct without requiring a huge amount of focus. I effortlessly picked the right gear every time, even when fairly distracted by conversation and the spectacular views. On the other hand, the engine/transmission combination was more questionable. The free revving engine was quick enough to allow rev–matched downshifts as fast you could toss the stick around, but the suggested shift points (as conveyed by the dash display) produced less than stellar results. More often than not, when the car suggested I upshift it would drop the revs right into an extremely rough 1200–1400 RPM range. Cruising in 5th or 6th gear around 1000 RPM there was minimal vibration, accelerate a little and upshift into 1500 RPM and it felt the same. Between the two speeds though, you could feel it throughout the car. My girlfriend kept blaming me for dropping the revs too low until I showed her that if I slowed down a bit the car kept cruising just fine and the shaking went away. I learned to work with it and ignore the car's advice, but the fact that there was almost no torque below 1300 RPM meant I often had to rev the car higher than necessary or be forced to endure an unwanted VAG massage when I was on a slight incline. Overall, these highs and lows combined with a predictable clutch earn the gearbox a middling rating. The radio reception was really good considering the mountainous terrain, but the stereo was entirely unimpressive. Same junk you'd find in any car under $40k. Major points lost however for the completely non–functional iPhone integration. Despite around 20 hours spent in this car, including an hour stuck outside of a tunnel, we were unable to get either of our iPhones (4 and 5C) to ungray the USB option on the media interface. Slightly redeemed by available SD card slot, but overall a major shortfall for a late–model car. Surprisingly, the Octavia had some pretty cool toys, especially for a rental model. Well calibrated rain–sensing wipers and parking sensors were nice convenience features, especially given the tight roads and highly variable precipitation we encountered. The car also had a very well–done engine stop/start system. It was completely unobtrusive, even with the manual, and I only turned it off once in heavy traffic. It even started the car back up if the engine stalled, avoiding the need to reach up to the ignition and back to the gear lever. An excellent feature for both convenience and safety. More points were earned by the Octavia's hill assist system, which held the brakes for two seconds or until you started releasing the clutch when on a hill. Very useful on the steep mountain roads we encountered. There was also a little cozy for the battery (for the cold I'm assuming), but my favorite feature of all was a built in ice–scraper conveniently stored on the inside of the gas flap. How cool is that?! According to our rental documents, the value of this car when purchased was 32,000 Swiss Francs, which would have been equivalently to a slightly larger amount in USD before the Swiss central bank's recent actions. So for pretty close to the average cost of a new car (welcome to 2015 people), you can get a diesel, manual, AWD wagon that's very comfortable to drive with some pretty neat features. On top of it all, we got 45 mpg, even with all the high–revving mountain climbing we did. This car is an excellent value, and my girlfriend and I both agreed that if they were available used in the US, we would absolutely love to own one. I had an amazing time with the Octavia, and came away seriously impressed. It was fun to drive, capable in a variety of conditions, with plenty of cargo room. This is a highly practical car that only proves the American affinity for crossovers is incredibly misguided. Wisen up North America, then maybe we can convince the Europeans to give us the good stuff. If you enjoyed my writing and would like to hear more about my adventures with Clyde, stay tuned for my upcoming writeup of the journey through Switzerland.